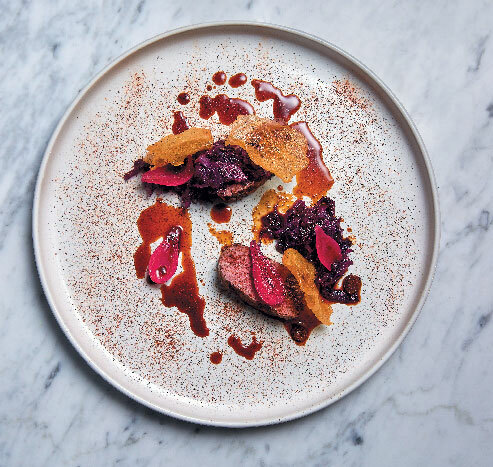 Chef Ash Heeger burst onto Cape Town’s culinary scene in 2016 with the opening of Ash, an upscale eatery focused on meat and flame. Now, a new name, new look and new menu offer a different perspective on Ash’s kitchen skills, with a trio of menus that deliver well-judged contemporary cooking in an elegantly revamped restaurant. The eye-catching leather chairs remain, but brighter decor and a cosy new terrace make Riverine Rabbit a far more inviting space. The menu options run from a simple three-course offering (R395) to a full nine-course tasting experience (R895). If you’re watching your budget, the lunchtime prix fixe (fixed price) three-course menu (R195) offers superb value for this level of cooking. The menus change regularly, but look forward to the likes of honey-cured beef balanced by a velvety hollandaise sauce, or subtle sea bream with mussels and fresh greens. My favourite dish was the fired mussels swimming in a delicious cider-butter sauce – thank heavens for crusty bread to soak up the last drops! Fine dining in feel, but with a welcome simplicity on the plates, this is complex, not complicated, cuisine that is well worth discovering.